The guided-missile destroyers USS Spruance and USS Preble sailed within 22kms of the Spratly Islands as part of what the US Navy calls a "freedom of navigation operation." The operation was carried out "to challenge excessive maritime claims and preserve access to the waterways as governed by international law," Cmdr. Clay Doss, a spokesman for the US Navy&apos;s 7th Fleet, told CNN. "All operations are designed in accordance with international law and demonstrate that the United States will fly, sail and operate wherever international law allows," Doss said, adding "that is true in the South China Sea as in other places around the globe." Shortly after that operation, China accused the US of trespassing in its territorial waters -- and said it had deployed missiles "capable of targeting medium and large ships." "The US action violated the Chinese laws and international laws, infringed China&apos;s sovereignty, damaged regional peace, security, and order," Foreign Ministry spokesperson Lu Kang said at the time. "China will take necessary actions to protect state sovereignty." 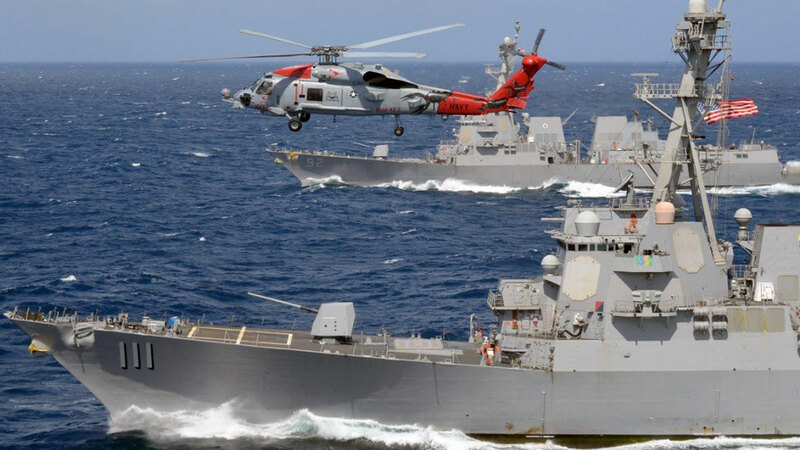 "There&apos;s been sort of a steady increase," Admiral John Richardson, the US Chief of Naval Operations, told reporters earlier this month when asked about China&apos;s militarization of the area. "The weapons systems have been getting increasingly sophisticated so it&apos;s something we&apos;re watching very closely," he added. "We&apos;ve got big interests there so we&apos;re going to remain there," he added, noting that about a third of the world&apos;s trade passed through those waters.